In the early 1900s, Hartford was a booming economic center. Italy, on the other hand, suffered both economically and socially. Hundreds of thousands of Italian men looked for unskilled work in other countries; many eventually headed to the United States. Hartford’s potential job opportunities attracted Italians and soon the city’s number of immigrants increased dramatically. Many of the Italian men became construction laborers building factories, housing, and railroads. However, Italians were the poorest paid workers in Hartford, earning substantially less than their Irish and German immigrant counterparts. Yet, old world traditions also sparked the entrepreneurial spirit of some Italian immigrants, and businesses like shoe-repair, carpentry, selling fruit, and barbering thrived. Italian women also worked but usually strictly in factories. Second-generation Italian immigrants found more success in securing skilled jobs—like bookkeeping, accounting, and clerking. Italian-Americans soon strived in the arts scene with Connecticut-born professional musicians and dancers filling the symphonies and ballet halls of the state. Connecticut Italian-Americans also entered sporting circles, like Christopher “Bat” Battaglini, who became a world champion featherweight boxer. By 1910, the population of Hartford was 14% Italian, and more than 60% lived in one small section of the city: the Front Street neighborhood. The neighborhood was built of three- and four-story brick tenements, with stores on the ground floors and businesses such as groceries, bakeries, fruit stores, and saloons filled these spaces. Pushcarts with vendors selling fruits and vegetables and stuffs from the homeland crowded the streets daily. 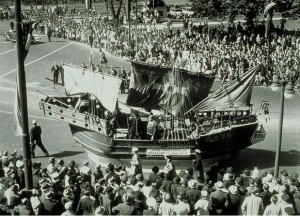 Religious festivals and parades sponsored by Italian social clubs also frequently filled the neighborhood. And when the day ended, neighbors sat on the stoops of their buildings and interacted with one another. However, major floods in the 1930s brought destruction to the neighborhood. Soon, city planners saw the Front Street neighborhood as prime real estate for urban renewal. Demolition for the Front Street neighborhood began in 1958 and was replaced with Constitution Plaza. Hartford’s “Little Italy” moved to the south end of the city near Franklin Avenue. In 2005, The Connecticut Historical Society received a large bequest from Gennaro J. Capobianco, the grandson of emigrants from Campania, Italy, and the proprietor of a local funeral parlor. Capobianco had a life-long fascination with the Italian immigrant experience in Connecticut and left CHS a collection of photographs and artifacts documenting his own family history. Mike Messina is the Interpretive Projects Associate at the Connecticut Historical Society. Clouette, Bruce. 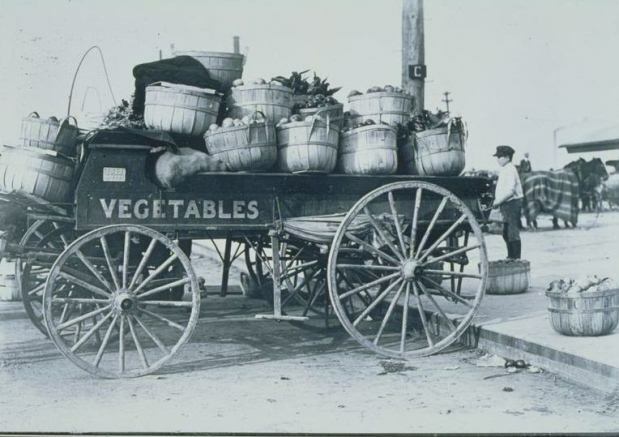 “‘Getting Their Share’: Irish and Italian Immigrants in Hartford, Connecticut, 1850-1940,” 1992.